Sometimes life can get hectic, big decisions need to be made or late nights working can leave you feeling run down and stressed out. Lately I’ve been trying to find the simple ways that I can de-stress and have a ‘mental’ break from it all, so that I can recharge, gain perspective & face my problems head on. Reading – I love nothing better than escaping into a good book and sometimes just the act of sitting still and allowing my brain to wander into a different place, allows me to put my worries into perspective when I finally put that book back down. Talking – Having someone to really talk to, for me it’s my Mum, should never be underestimated and can be a life line and a source of perspective when we really need it. Thanks Mum! Laughing – This is where my Dad comes in. He always makes me laugh no matter what state I’m in and I always leave a phone call with him feeling happier, smiling & more hopeful. Try to find a little bit of laughter wherever you can, even if it’s at your own expense! Laughing at yourself can really help to keep perspective & to bring a little bit of lightness to certain tough situations. I can’t say enough about the power of laughter from my own experience & I thank the heavens that I have a husband that makes me laugh everyday & always tries to find the lightness in life. 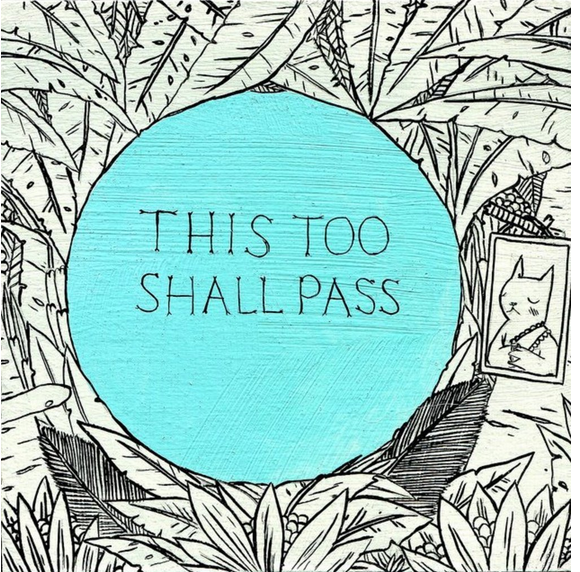 Like the above phrase says, “This to shall pass”. Sometimes this is hard to remember, when we are caught up in our own lives, problems or grief – but it’s always helps me to remember that what I’m currently worrying about will eventually pass and that life always keeps moving. This may sound weird, and may be something I get from my Mum, but when I’m stressed out or anxious, I find cleaning or more specifically de-cluttering really helps. My husband always says if anything is left lying around too long I’ll throw it out, but I just always feel clearer and more settled when the place is clean and things are in order. This may be my need for control but at least it’s a healthy and constructive form of therapy! I’ll be the first to admit that sometimes I worry over things that don’t deserve to stress me out that much or over things that haven’t (or mightn’t) even happened yet. Everyone has different stress triggers & handles their stress or problems in different ways – over the years I have learnt to understand myself enough that although I stress out easily & am sensitive by nature, that that’s ok & I don’t have to beat myself up about it or try to be something I’m not. I also try to remember what my Dad always says “don’t worry worry till worry worries you” – if I don’t always live by that rule, at least it cheers me up & reminds me of my Dad! Talking to myself – first sign of madness right? Not so much for me. Like a lot of people I suffer with negative self talk, so I combat that during difficult times, by literally talking ‘sense’ to myself. You know what I mean – giving yourself a pep talk so that you don’t give in to the negative or dwell on the difficult & get stuck. Sometimes you need to be your own cheerleader & remind yourself that your stronger then you think. What do you do to de-stress? Is your de-stress list working for you or does it need updating?